OFFICIAL REGISTRATION OPEN MONDAY JUNE 12TH at NOON. WORKSHOPS FILL UP FAST! *This workshop is specifically for any one who identifies as a woman, trans, or gender non conforming. Apply for the workshop HERE. The application allows us to fill the workshop in a way that is true to our mission. We’ll let you know on Monday June 12th if space is available. 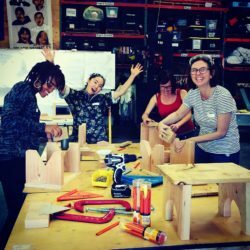 This entry was posted in Uncategorized and tagged empowerment, empowerment workshops, feminism, frailty myths, intersectional feminism, skills training, smash patriarchy, tools, women carpenters, woodworking. Bookmark the permalink.